This year’s events are quickly approaching! Are you ready for another year of friendly competition, new challenges and fun? If you are new to the Masters Games, the first step to getting involved is finding out which district you belong to. 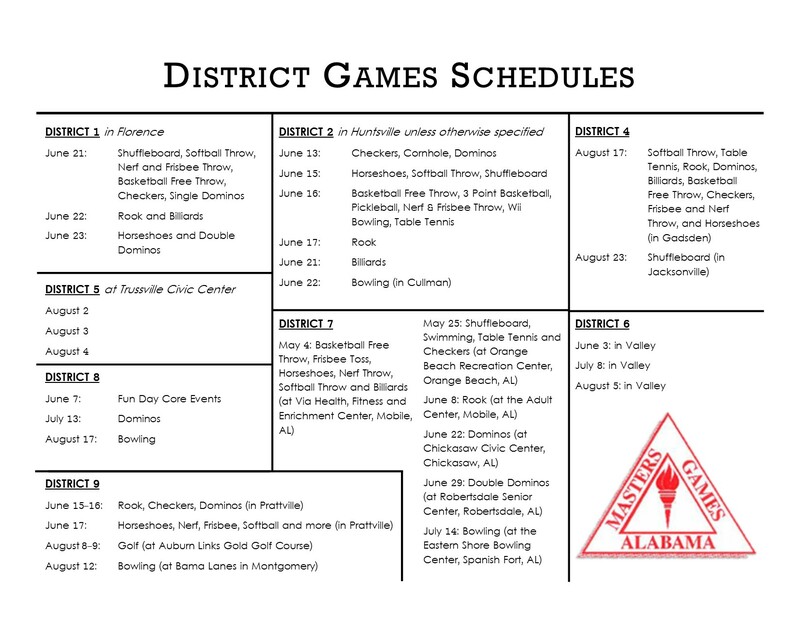 Visit www.mastersgamesalabama.org/districts to see a map of Alabama divided into districts. From there, contact your district representative and get registered today! New to this year’s games is Pickleball! This easy-to-learn and play game, which combines aspects of badminton, tennis and table tennis, will be offered at several district games and state games. Whether you’re a pro or a rookie, this new event is sure to get everyone moving and having fun! Rally scoring will be used in scoring the game. For a complete list of rules, click here. Save the date! District 9 will be hosting a golf tournament, singles and scrambles, on August 8 and 9. ALL districts are invited to attend! The tournament will be held in Auburn at Auburn Links at Mill Creek. The entry fee is $10 plus $35 per day. Winners will qualify for the state tournament on October 10 and 11 in Trussville. For entry forms or more information, call the Central Alabama Aging Consortium at 334-240-4666 or 1-800-264-4680. Don’t forget, nominations for the Golden Alumni and All Star Awards are accepted during district games! Golden Alumni Awards are given to people who have been active in the games in the past, but who are no longer able to take part after the awarding year. All Stars Awards are given to people who are currently competing in Masters Games of Alabama and plan on participating in the future. If you see a teammate or player who you think derves to be honored, turn in a nomination to your district representative! Winners will be chosen by the Masters Games Award Committee based on the impact they have had on Masters Games and the impact that Masters Games has made on their lives. This year’s games will be held in Trussville October 10-13. Check out the schedule here!